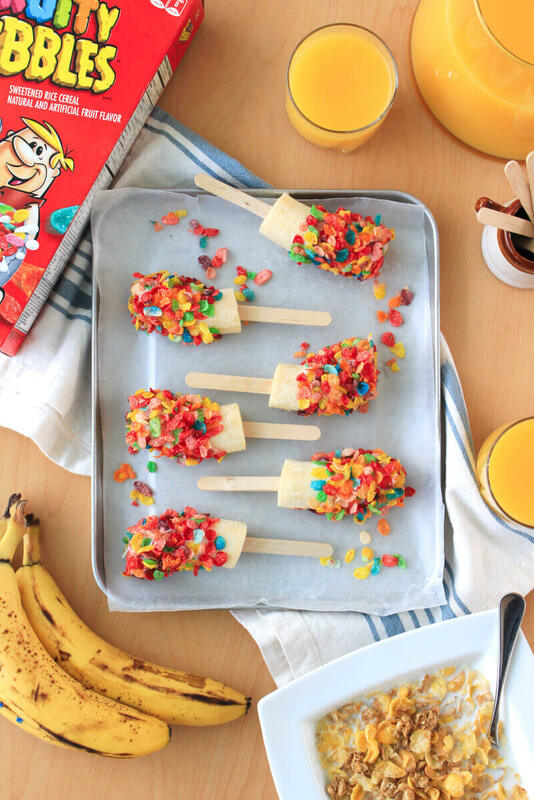 Fruity Pebbles and Banana Breakfast Pops will bring some fun to your regular breakfast routine! Make a batch of these 3-ingredient frozen pops for easy grab and go breakfasts or snacks all week long! Frozen bananas are magical. No, really, I mean it. Have you ever eaten frozen bananas? When you freeze a banana the texture transforms from soft and mushy to kind of icy, but still biteable, making it strangely reminiscent of ice cream. Frozen bananas are like ice cream's healthier frozen cousin. Magical, I tell you. I usually blend up my frozen bananas to make frozen banana ice cream that's kind of like soft serve. Recently, I found myself with an excess of bananas after my husband and I both picked up a bunch at the store, so I decided to get creative and find new ways to enjoy my magical frozen bananas. This time, I made banana breakfast pops! 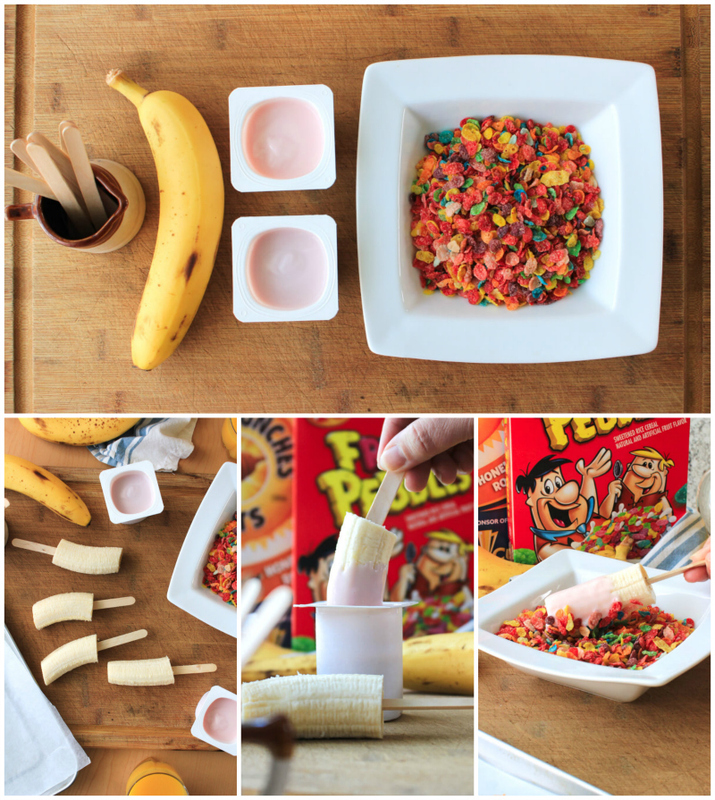 My kids are big-time frozen banana fans, too, so I made this fun breakfast with them in mind featuring the extra bananas I had and bright, yummy Fruity Pebbles from the cereal aisle at Publix. This 3-ingredient recipe is almost too easy to make and is going to make my morning breakfast struggles a breeze. I mean, my kids will eat, don't get me wrong. I'll just say that, more often than not, they are less than enthused to eat breakfast before school. These pops, though? These pops get them excited about eating in the morning! I mean, what's not to love? Not only do they taste fabulous, but it's like they're eating a breakfast dessert! However, don't be deceived. 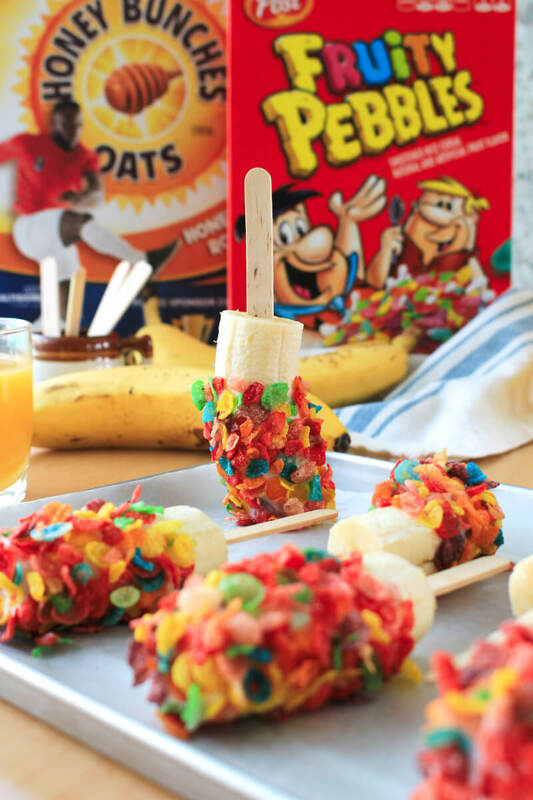 While these Fruity Pebbles Banana Pops taste like dessert, they are made up of simply bananas, yogurt, and Fruity Pebbles. Yup, that's it! Oh, and you will need popsicle sticks to make them. Popsicle sticks are necessary to make a popsicle a popsicle! You should be able to find them at Publix when you pick up the Fruity Pebbles. 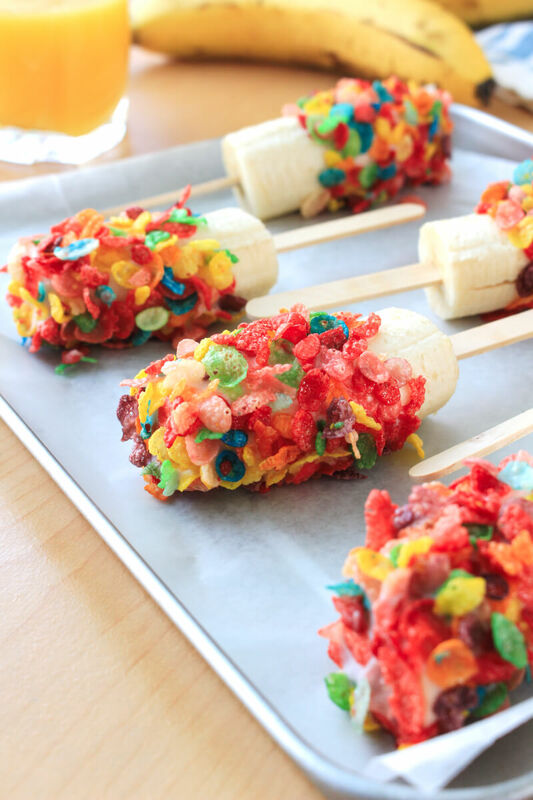 To make these pops, you put half of a banana onto a stick, it takes a dip into some yogurt, and then finally a roll in the Fruity Pebbles. Freeze the pops for at least two hours and you are good to go! 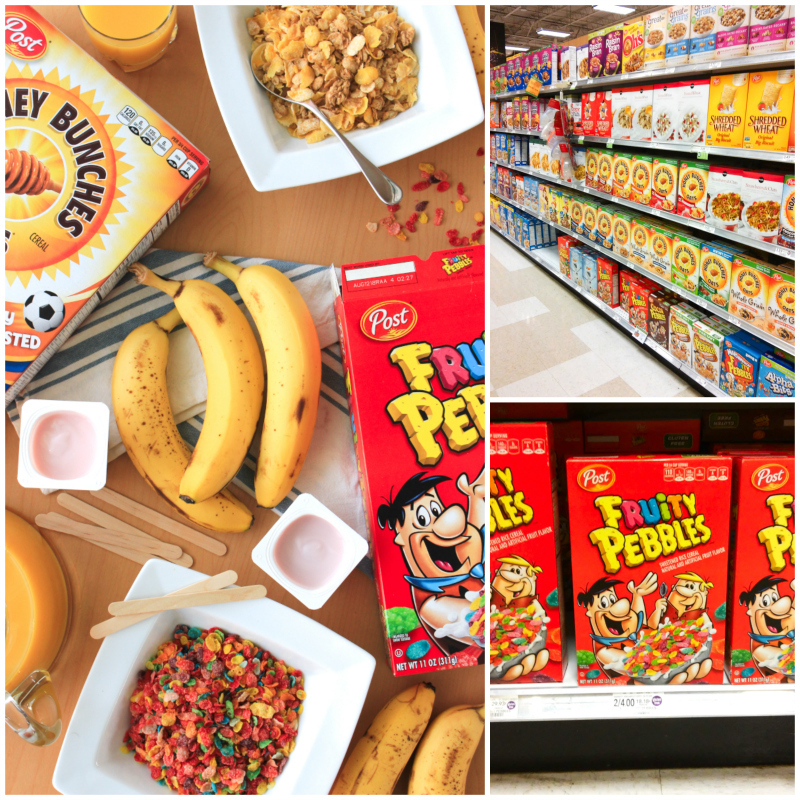 All you have to do then is reach into the freezer and you'll have a Fruity Pebbles and Banana Pop that is perfect for breakfast or a quick snack! You can easily customize these tasty pops by mixing up the flavor of yogurt or kind of cereal you use, but we've found Fruity Pebbles with strawberry yogurt to be our favorite. I just know that you and your family will absolutely love these dessert-like breakfast pops! They will bring some fun to your breakfast routine, guaranteed! 1. Peel the bananas and cut each banana in half crosswise. Insert a popsicle stick into each piece of banana. 2. Dip each banana into the yogurt. Let excess yogurt drip off. Roll each banana pop in the Fruity Pebbles. 3. Freeze the popsicles on wax paper for at least 2 hours. Let sit for 5 minutes at room temperature before serving. Try different cereals (such a Honey Bunches of Oats or Cocoa Pebbles) and different kinds of yogurt (such as vanilla, strawberry, or blueberry) for fun flavor combinations!